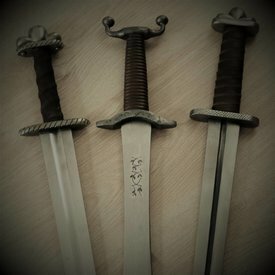 Blunting service for semi-sharp dagger. When using the blunting service, the return right and warranty expires. The extra delivery time is approx. 3 weeks. Did you order a semi-sharp dagger and do you want to have it blunt? Choose this blunting service. Please note: although the thickness will be the same as a battle-ready dagger, the return right and warranty expires when using the blunting service. The extra delivery time is approx. 3 weeks.